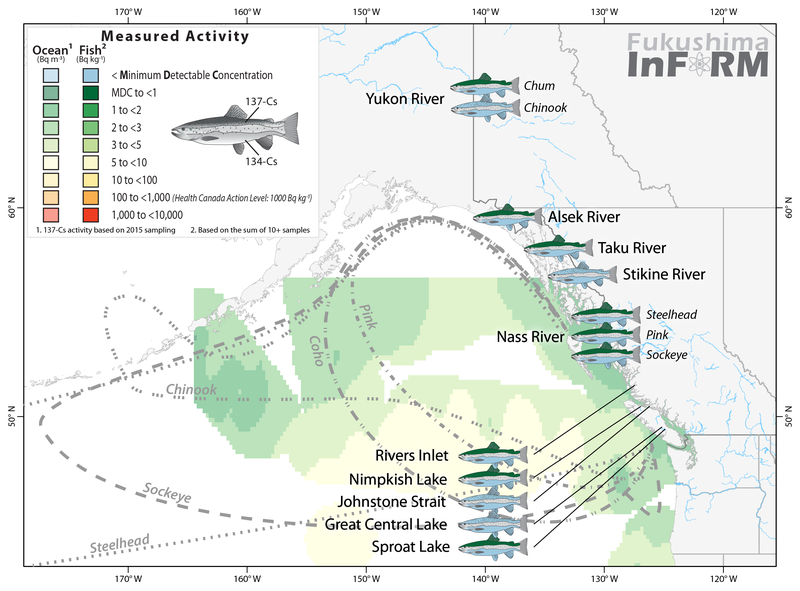 Between 2014 and 2016, nearly 400 salmon samples have been donated, processed, and analyzed by InFORM collaborations with First Nations, Fisheries and Oceans Canada, and Health Canada, respectively. 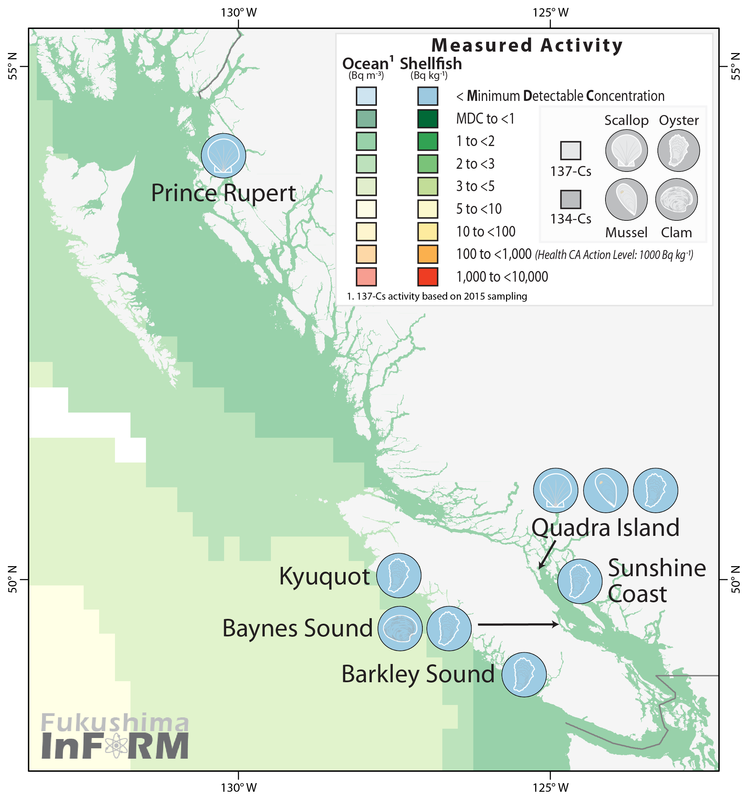 By summing the gamma spectra of all the results from each year, we found no significant increase to the 137Cs concentrations in BC salmon that would indicate considerable bioaccumulation of the Fukushima radiation plume to date. For the nine samples from 2016 that did have measurable levels of 137Cs after 6 hour count times, Health Canada scientists plan to freeze dry and count them for up to two weeks on the gamma spectrometer. This more in-depth analysis will help determine what, if any, proportion of if these low concentrations can be attributed to the Fukushima accident or radiation remaining in the environment from atmospheric weapons testing. The process is analogous to lengthening the exposure time on a camera to capture a good night scene, or in this case to see greater detail in the radionuclide composition of the sample. Specifics of this process can be found in our methods and are similar to how we determined the presence of Fukushima contamination in 2015 samples. Results will be posted when they are available. Interestingly, this year we have replicate samples from different species from the same river for the first time. While the number of samples and the statistics don’t allow us to speculate a reason for the differences between the species at this time, Dr. Trudel wonders if these interspecies differences may reflect the diet and life cycle/growth efficiency of each species. These are still areas of research where little is known, so the new data collected as part of the InFORM monitoring will be helpful in teasing out the dominant biological processes. Results from 2016 shellfish monitoring did not find any 134Cs or 137Cs detected in the shells. Neither radionuclide was detected in the meat as reported earlier. Results are also now available from the shells of shellfish sampled from BC’s main aquaculture regions and show an absence of both 134Cs and 137Cs isotopes. The results from the meat were previously released. In fact, the shells had undetectable concentrations of naturally occurring potassium-40 (40K), one of the most abundant radionuclides in the ocean. This was a first for any biotic sample measured by InFORM to date and is a finding that highlights just how selective these molluscs are when making their shells. The fact that no detectable Cs was observed in the shellfish could be due to the high water content of the flesh, or because the Fukushima contamination is just now entering the coastal waters and has not bioaccumulated to detectable levels. The meat from these samples will be freeze-dried placed on the detector once again for a longer duration to give a better picture of the isotopes present. These observations are interesting because previous research on tropical shellfish that were showed that molluscs tend to bioaccumulate cesium at rates faster than other organisms. So far, this has not been observed in InFORM samples. While 40K levels were below the MDC (~10 Bq kg-1) for all shellfish shells, the measured levels of 40K in the meat averaged ~90 Bq kg-1. This is similar to levels seen in humans where the typical 70 kg human has a concentration of ~70 Bq kg-1 of 40K in their body that are obtained largely through diet. All of these results are now available on Open Data Canada as with the rest of the InFORM biotic monitoring results. Monitoring of both salmon and shellfish is expected to continue in 2017.